When building or purchasing an existing property, it is important to consider its potential exposure to subsidence. Properties built on clay soil are at higher risk of subsidence, especially if there are nearby trees. Tree roots can be far reaching, absorbing moisture from the soil under your property, causing the ground to become unstable and shrink. So how close can a tree be to a property before it becomes an issue? This distance varies depending on the species of tree. 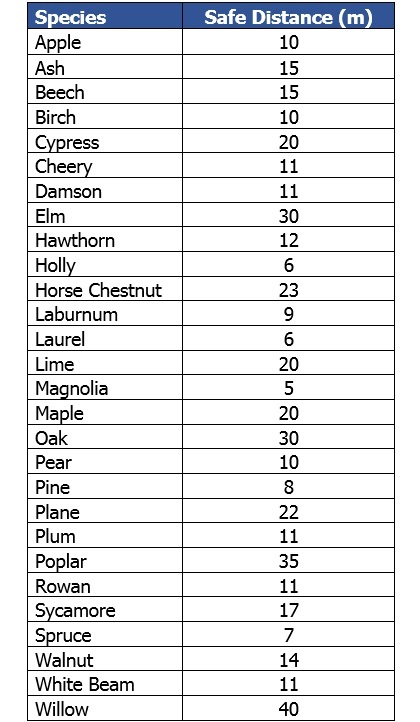 The below table offers a guide as to what is a typically safe distance between a tree and property. Figures were taken from the Association of British Insurers. For more information on subsidence risk and cover, please get in contact with our Property division on 020 7256 7300.